The Fulton Montgomery Regional Chamber of Commerce has announced that tickets are on sale for its 22nd annual fundraiser to help their work in promoting the Fulton County region to visitors. 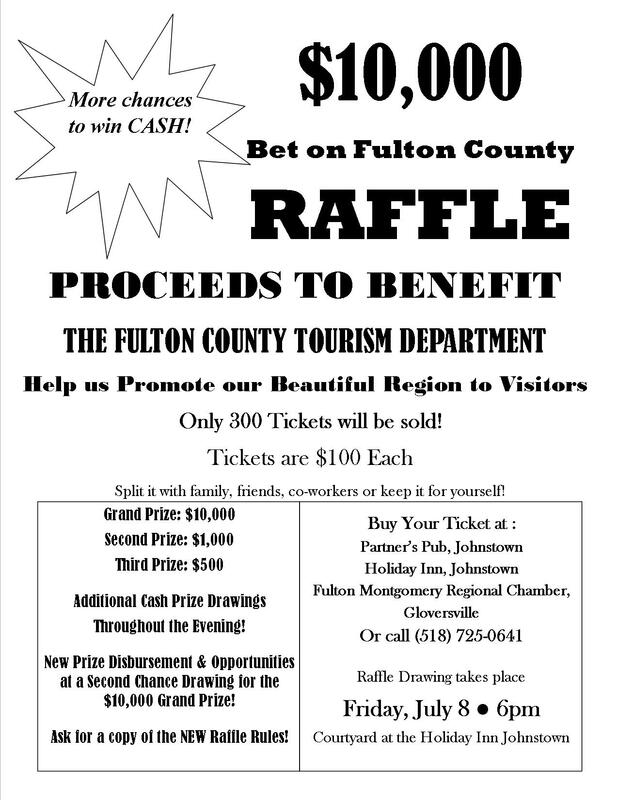 The $10,000 “Bet on Fulton County” Raffle drawing will be held on Friday, July 8, 2016, from 6:00 p.m. – 8:30 p.m. at the Holiday Inn Johnstown-Gloversville, 308 North Comrie Avenue, Johnstown, NY. Only 300 tickets will be sold and the top prize is $10,000. 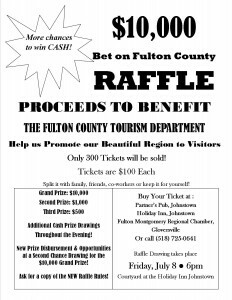 The Bet on Fulton County raffle has always been a process of elimination raffle which means all tickets sold go into the raffle barrel. Tickets are then drawn from the raffle barrel and the numbers are announced to those in attendance at the event, and are taken down from a raffle board that shows any tickets that are remaining in the barrel that are still available for the top prizes. New to the event this year are additional, exciting ways for ticket holders to win cash prizes throughout the evening, and to have a second chance at winning the top prizes. For every 25th ticket drawn there will be an opportunity to choose between a $100 cash prize or to be entered into a “second chance” drawing. If the second chance drawing is chosen, these tickets will be placed in a separate bin, apart from the raffle barrel. When the last five tickets remain in the raffle barrel, one ticket will be drawn from the “second chance” bin and placed into the primary raffle barrel. This allows the ticket holder another chance for the top prizes, including the grand prize of $10,000. Tickets are on sale for $100 each and only 300 will be sold. Tickets are available at the Chamber office, 2 North Main Street, Gloversville; Partner’s Pub, 21 South William Street, Johnstown; and at the Holiday Inn Johnstown-Gloversville, 308 North Comrie Avenue, Johnstown. The Grand Prize is $10,000, and additional cash prizes will be awarded. Ticket holders are invited to enjoy entertainment, a free-of-charge picnic style dinner, and cash bar at the event on July 8. Please bring your lawn chairs. For a complete copy of the new rules or more information, call the Fulton Montgomery Regional Chamber of Commerce at (518) 725-0641 or e-mail tourism@fultonmontgomeryny.org. Photos from last year’s event can be found on the Visit Fulton County, NY Facebook page. Thank you to Partner’s Pub, Holiday Inn, & the Fulton Montgomery Chamber Staff who sold raffle tickets! Thank you to Brilliant Design & Print for donating the raffle tickets!